Two games. One day. One champion. Roustabouts entered the tournament as the three seed and needed three wins to take home another league title. In a challenging back-to-back on championship Sunday, they first dispatched 99 Problems and were well on their way to the title game against Local Sports Team. Both squads have adept offenses, but it was the Roustabouts defense that proved the difference. 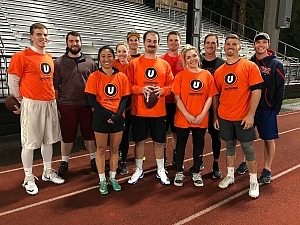 They stymied the oft-potent LST passing game, holding them to only 30 points; Roustabouts rose to the occasion and took down two top-tier opponents on their way to the crown. In the final game of the entire season, AKS Engineering and Florist Dragons went toe-to-toe in the closest match up of season. 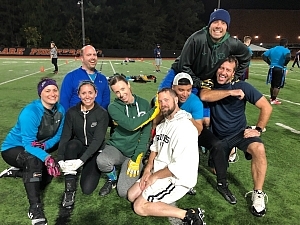 AKS was in their inaugural Underdog season, while Florist Dragons were back to defend their Division 2 crown. Florist Dragons started out hot, snagging a pick six on the first play of the game. Throughout the first half, the Dragons held the advantage. However, as time wore on, AKS made big plays at the right time to close the gap, and eventually go ahead in the second half. Both teams were tied at the two minute warning. AKS thrived on the big play, and another monster throw was the difference. A touchdown with 17 seconds left to play put the game out of reach, and AKS took home first place in their inaugural season.